You know when you’re looking forward to that perfect steak dinner, just to find out that you accidentally over- or under-cooked your steak? Never again! 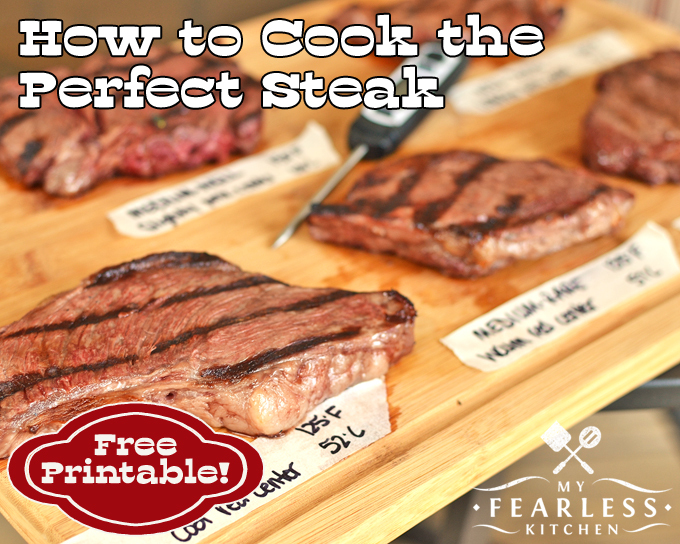 These are the best tips for how to cook the perfect steak! Cooking the perfect steak is all about getting the temperature right – for you. Maybe you like steak cooked medium, but someone else in your family likes steak rare, or even well done. You can cook a steak to whatever “doneness” you want, and even cook different steaks to different temperatures! Of course the best tool to make sure that you cook a steak to the perfect temperature is a meat thermometer. I prefer the probe-style thermometers with a long cord that plugs into a base. These long cords mean that you can insert the thermometer before you begin cooking, and just leave it in place until the steak reaches the right temperature, instead of guessing or inserting and removing an instant-read thermometer multiple times until you get it right. (Poking multiple holes in the steak like that will allow the natural moisture to leak out, and could leave you with a dry steak. Nobody likes that!) This probe thermometer has cables that are heat-resistant, making it perfect for cooking on the grill. If you don’t have a meat thermometer handy, you can get a good approximation of the final temperature by using your hand. I’ll show you how in the photos below. The USDA recommends that beef be cooked to a minimum internal temperature of 145 degrees F (63 degrees C), with a 3 minute rest. This is considered medium “doneness” in a steak. 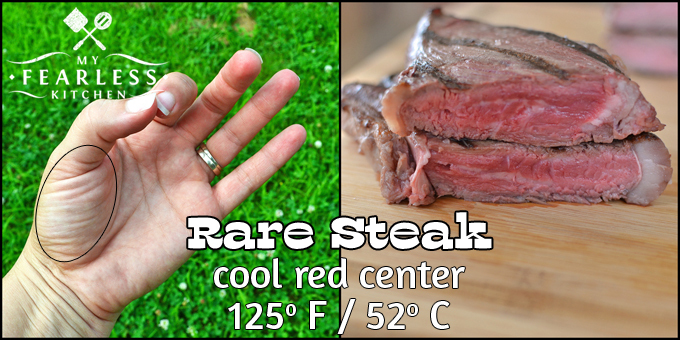 You’ll want to take your steaks off the heat when they are 3-5 degrees lower than your target temperature. The internal temperature of the meat will continue to rise as it rests, bringing it up to the perfect temperature when you’re ready to eat it. A rare steak is cooked to 125 degrees F (52 degrees C). The center of a rare steak is red, and still cool. 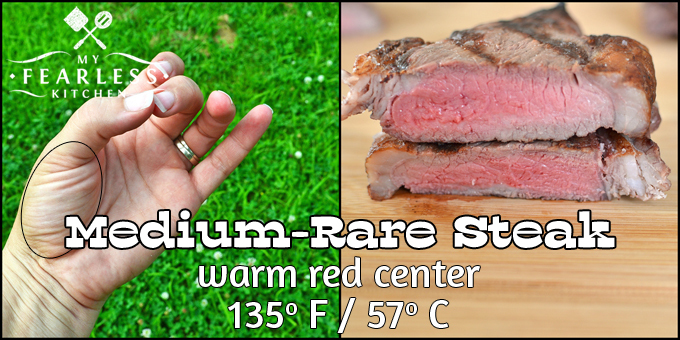 A steak cooked to rare will feel like the base of your thumb when you touch your index finger and thumb together. A medium-rare steak is cooked to 135 degrees F (57 degrees C). The center of a medium-rare steak is red and warm (unlike a rare steak, which is still cool in the center). A steak cooked to medium-rare will feel like the base of your thumb when you touch your middle finger and thumb together. A medium steak is cooked to 145 degrees F (63 degrees C). This is the minimum recommended internal temperature for beef. 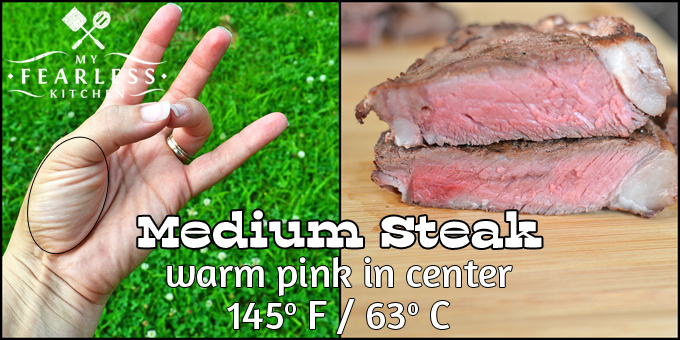 The center of a medium steak is pink and warm. A steak cooked to medium will feel like the base of your thumb when you touch your ring finger and thumb together. A medium-well steak is cooked to 150 degrees F (66 degrees C). The center of a medium-well steak is slightly pink and warm. There is not a great comparison on your hand for a medium-well steak. It’s somewhere between the feel of a medium and a well done steak. A well done steak is cooked to 160 degrees F (71 degrees C). The center of a well done steak is hot, with little or no pink. A steak cooked to well done will feel like the base of your thumb when you touch your pinky finger and thumb together. One more thing to be aware of… the longer steaks cook, and the higher their internal temperature gets, the more moisture (and flavor) they lose. This can result in a tough, chewy, dry piece of meat. Even the most perfect steak can be “ruined” by cooking it too hot or for too long. It’s always easier to heat a steak a little more, than it is to “uncook” a steak that has been cooked for too long. 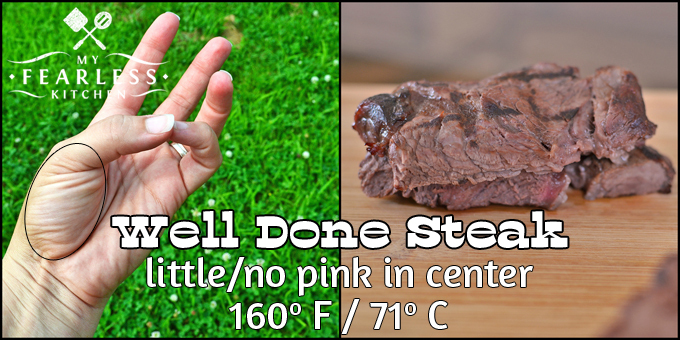 Use this trick and never have an over- or under-cooked steak again! Be sure to download and print your free cheat sheet here. Are you wondering about pork chops, instead of steak? Pork chops are sort of the same as steaks, but not quite. Pork chops should be cooked to a minimum internal temperature of 145 degres F (63 degrees C) with a 3 minute rest. What is your favorite way to enjoy steak? Thank you very much for the steak color and temperatures to indicate when done. It’s my pleasure! I hope you enjoy a great steak! I really like how you explained how to tell the “doneness” of a steak by using your hand. It never occurred to me that when you touch your first finger and thumb together, the steak should feel like the wrinkly part of your hand/wrist. This is great information and I will be sure to use this for when the next time I cook a steak! Thanks for sharing! My pleasure, glad I could help! Enjoy your next steak!